The SERFAS Bike Transport (SBT) is the successor to the Serfas SBC bike case designed to compete with popular Trico Iron Case and the Thule 669 Round Trip. Like those bike travel cases and other that cost 3 times as much, the SBT has a clam shell design, a tough outer polyethylene shell, 3 foam sheets and internal straps to reduce movement and buckle and strap closures. But where this case leaves both its competition behind is that it was designed to meet the International Shipping Size Restriction of 130"/330cm (Size = L + 2W + 2H). That is huge, or should we say small for it which lowers your cost of ownership/use substantially and expands your shipping services. All while providing basically the same amount of interior room to pack. Say what? You heard me a product that was designed for real world use and to save you money. 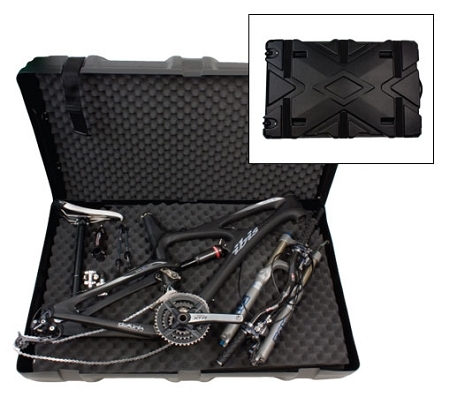 Nice work Serfas, your SBT is our best value bike case.